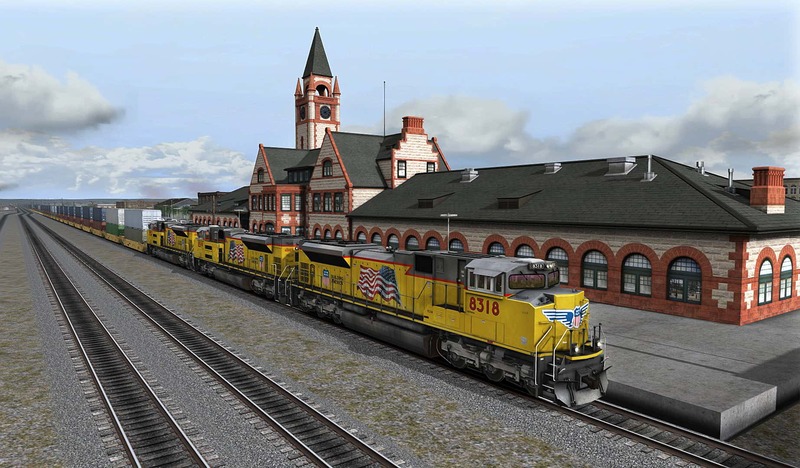 Now available, Union Pacific Scenario Pack 01 delivers contemporary and challenging UP railroading! 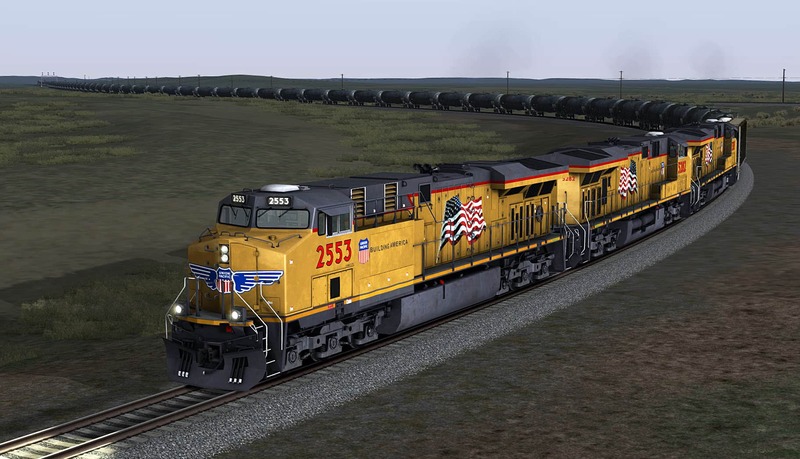 Contemporary, captivating, and challenging modern Union Pacific railroading now awaits you in Union Pacific Scenario Pack 01, from High Iron Simulations! 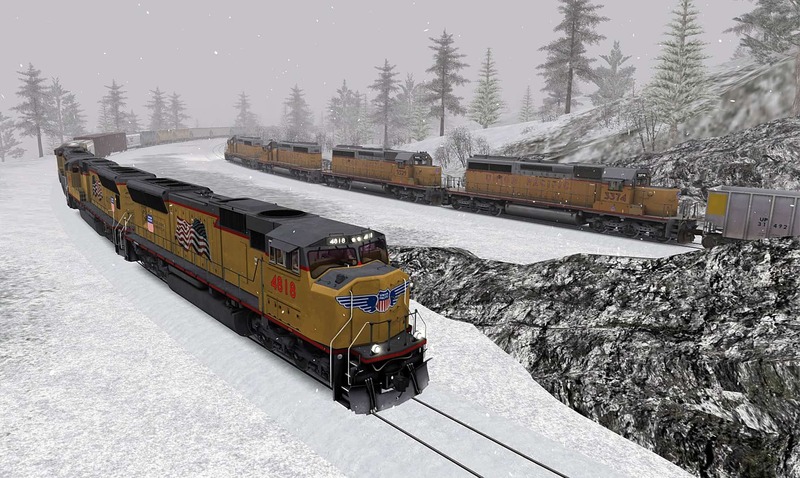 Featuring ten authentic career scenarios based upon actual UP operations and train symbols, this new pack puts you to work on two legendary segments of Union Pacific’s bustling transcontinental railroad as it exists today – Wyoming’s famed Sherman Hill and California’s legendary Donner Pass! Extending west from Cheyenne to Laramie, Wyoming, the Sherman Hill route (UP’s Laramie Subdivision) represents the traditional heart of the Union Pacific, while the Donner Pass line (which Union Pacific acquired in 1996 with the Southern Pacific) is one of America’s railroad engineering marvels. 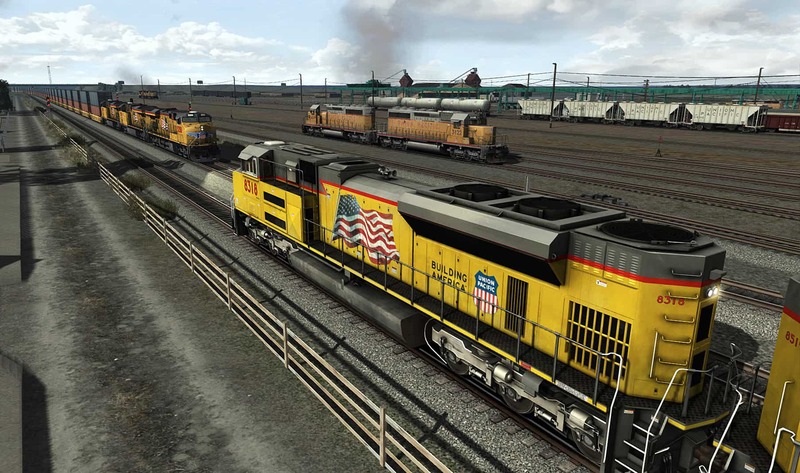 In Union Pacific Scenario Pack 01, you’ll tackle a variety of challenging contemporary freight duties ranging from high-priority intermodal and produce traffic to lugging manifest freights and crude oil, handling locals, and working yard-switching chores. And in the process, you’ll experience diverse diesel power, including modern Union Pacific GE ES44ACs, EMD SD70Ms, and SD70ACes; veteran EMD GP40-2s and SD40-2s; and UP’s unique rebuilt SW10 “Hammerhead” switchers! 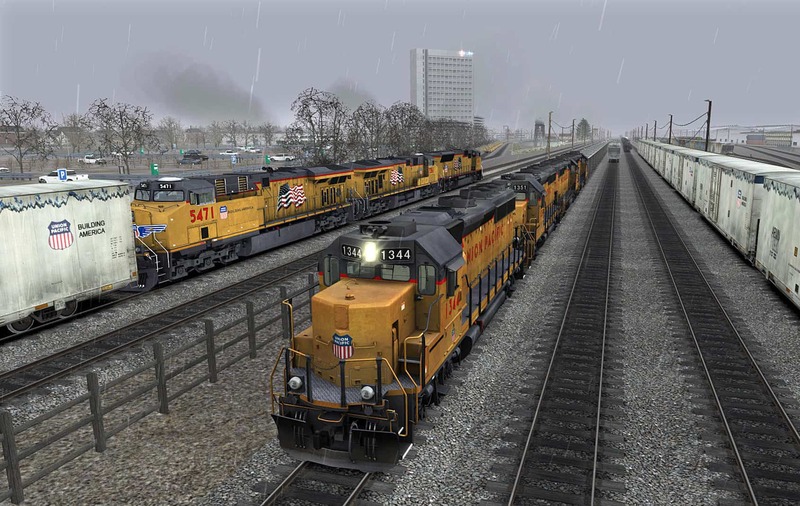 Union Pacific Scenario Pack 01, from High Iron Simulations, includes ten realistic career scenarios based upon actual UP operations that bring to life contemporary Union Pacific railroading! The Union Pacific is a conveyor of container traffic moving not only across America, but across the world, and in the two-part scenario “Global Bound,” you are the engineer of Union Pacific symbol KLBG3 forwarding container traffic from the Pacific port of Long Beach to UP’s “Global 3” intermodal terminal in the Chicago area. 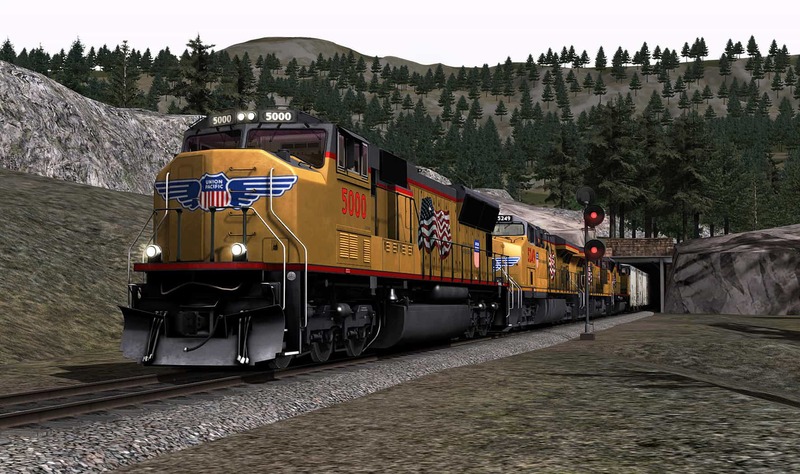 A trio of potent UP EMD SD70ACe diesels provide the power to battle legendary Sherman Hill. Screenshots by Gary Dolzall. Union Pacific is a major transporter of crude oil and one of many UP unit-train oil movements is symbol OOGOM, which transports oil from an originating source at Ogden, Utah east to Omaha, Nebraska. In the scenario “Oil to Omaha, you are the engineer of a heavily loaded OOGOM headed east with GE ES44ACs fore and aft. 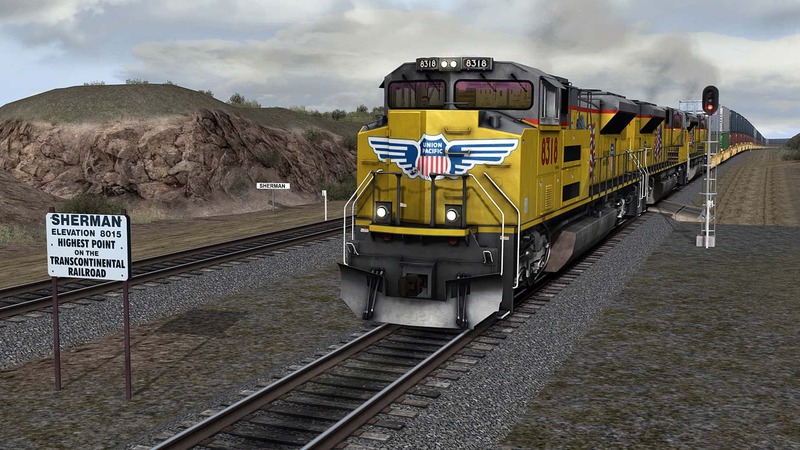 You’ll climb aboard veteran Union Pacific EMD power in a pair of realistic scenarios. The Granite Canyon Quarry located on the east slope of Sherman Hill has long been a source of tonnage for the Union Pacific. 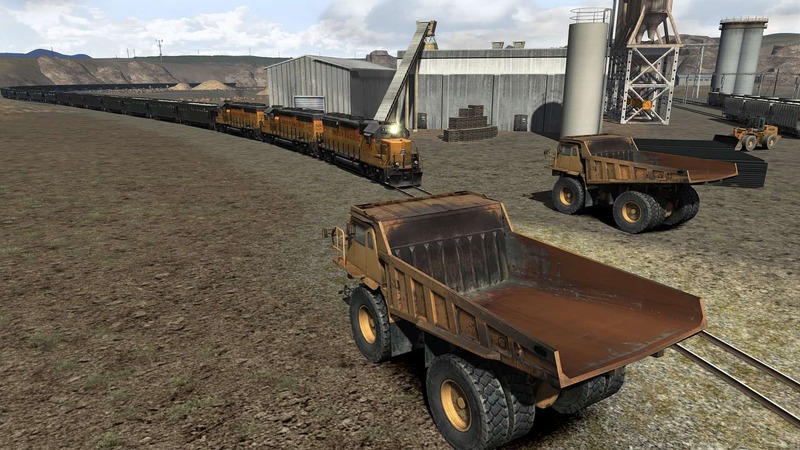 UP serves the quarry with a job from Cheyenne to Granite and return, and in the scenario “UP’s Granite Switcher” you will be pulling together loads of ballast (above) for the return run to Cheyenne Yard. 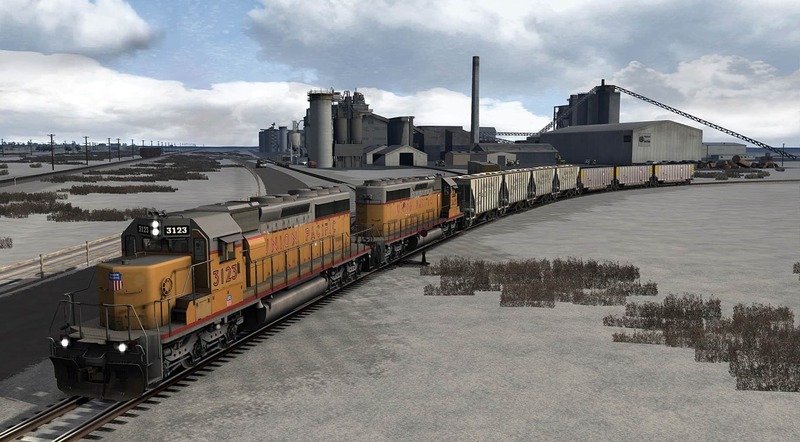 In the scenario “Laramie Subdivision Local,” you are the engineer of a local freight with a pair of UP EMD SD40-2s as power and have work to do at the Laramie Cement facility (below) before proceeding to Laramie Yard to tie-up for the day. Union Pacific’s “Cold Connect” services are the modern edition of the railroad’s long-standing haulage of west coast produce to eastern markets. Operated jointly by Union Pacific and CSX between Delano, California and Selkirk, New York, train ZDLSKP hauls produce and is nicknamed the “Salad Shooter.” In the two-part career scenario “The Salad Shooter,” you are the engineer of the ZDLSKP (above and below) on an autumn morning, taking the priority train up and over the heart of Donner Pass from Colfax to Truckee, California. The scenario “Roseville Hammerheads” represents a throw-back to 1997, shortly after Southern Pacific’s merger into the Union Pacific. You are the engineer of a switching job at sprawling Roseville (California) Yard and have a variety of duties to perform, including moving a string of retired Southern Pacific GP9s into storage. Your yard power is a pair of Union Pacific’s distinctive rebuilt SW10 “Hammerhead” switchers. In the career scenario “Truckee Bound Ballast,” Union Pacific is performing M-O-W work on the Roseville Subdivision and you are the engineer of a westbound loaded ballast extra – symbol WSKRVB – bound from Sparks, Nevada to Roseville, Calif. Traffic is heavy on the Donner Pass route on a rainy spring day as you depart Sparks Yard and climb the east slope of Donner Pass with Union Pacific EMD GP40-2s providing the power. In a display of the energy and non-stop verve of today’s Union Pacific, east- and westbound stack trains meet at Laramie, Wyoming on the Sherman Hill route. 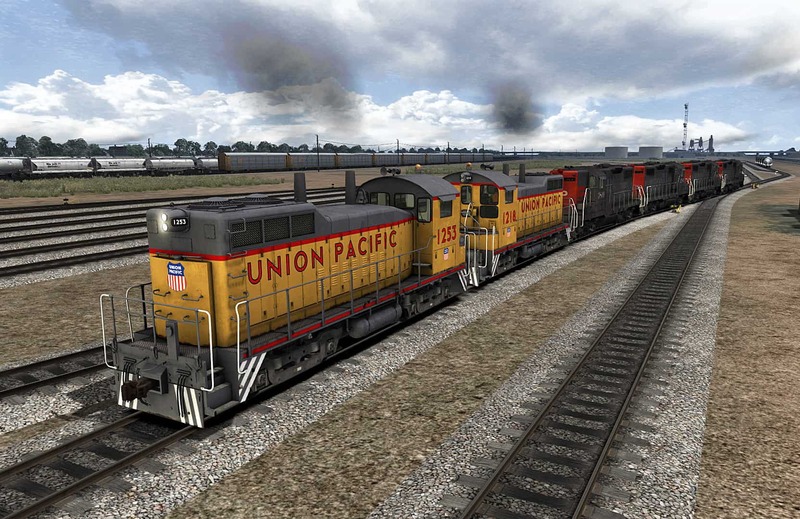 The modern railroading action is brisk, authentic, and challenging in Union Pacific Scenario Pack 01 – now available at the Steam Store!